Teach All the Word Problems! The cornerstone of primary math is number sense - and primarily mastering the concept of addition and subtraction, hopefully even gaining automaticity with those addition and subtraction facts. Elementary teachers live and breathe addition and subtraction! Teachers work all year to help children build conceptual understanding, make connections, and see relationships - working their behinds off modeling and practicing those concepts and helping kids gain a deep understanding. Then comes the mastery piece - fact fluency. It is a ton of hard work! But the word problems. Oh, the word problems! That's the piece that sometimes gets left by the wayside in the desperate attempt to drive home fact mastery. It doesn’t seem too complicated at first glance because we have used story problems since Kindergarten to help students build a conceptual understanding of addition and subtraction. But we can easily get stuck in the basic join and separate word problem set and not even realize that there are many more ways that problems can be presented. When pushing through that quick word problem of the day, it’s easy to forget to increase the complexity of the problems we present. Now as a fourth grade teacher, I can see how essential those early word problems are. If students didn’t learn to understand and solve complex addition and subtraction word problems in the early grades, they have a much more difficult time understanding multi step multiplication and division problems in the upper grades. They need that foundation on which to build the new concepts. 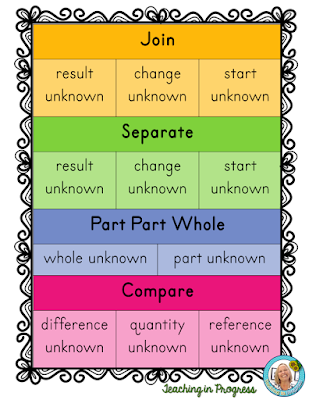 It is so important for kids to have daily opportunities to solve all different types of word problems. And not just any old problem we come up with on the fly, but varied and wide ranging. 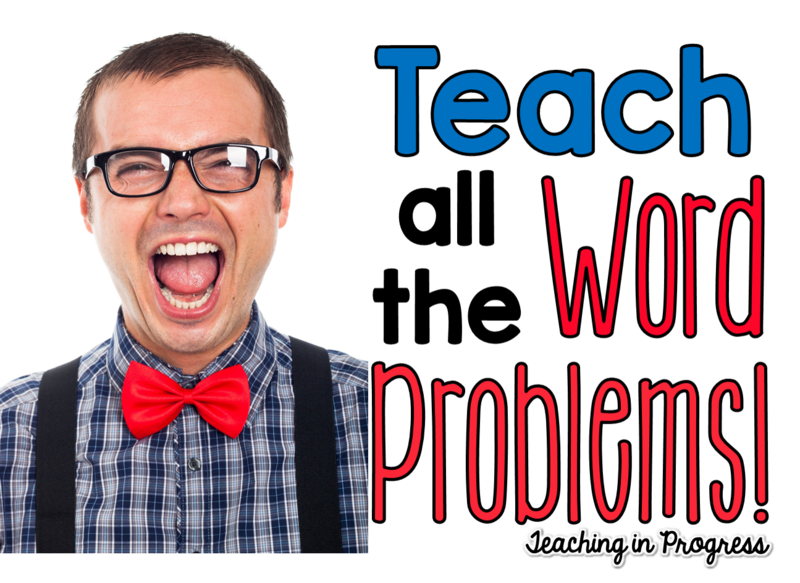 When teaching first grade, I found myself forgetting to include all the types of word problem types. I tended to go with the familiar. So I incorporated daily word problem practice and I found it helpful to keep a chart handy so I could keep track of the problems we were working on and ensure that my students were getting exposure to all problem types. And 11 subsets? Take a look at this chart based on the CGI model. Join problems involve an action, with a set being added to an existing set. We know the parts and need to find the sum. Joe had 3 pencils. Meg gave him 2 more pencils. How many pencils does Joe have now? Joe had 3 pencils. Meg gave him some more and now Joe has 5 pencils. How many pencils did Meg give Joe? Joe had some pencils. Meg gave him 2 more and now Joe has 5 pencils. How many pencils did Joe have to start? All of these problems involve joining two sets, but once the start and change become unknown, the problem requires a deeper understanding. Separate problems also involve an action with a set being removed from an existing set. Joe had 5 pencils. He gave 3 of them to Meg. How many pencils does Joe have left? Joe had 5 pencils. He gave some of them to Meg and now he has 2 pencils left. How many pencils did Joe give Meg? Joe had some pencils. He gave Meg three and now he has 2 pencils left. How many pencils did Joe have to start? All subtraction problems, but presented in ways that allow for a more conceptual understanding of subtraction. 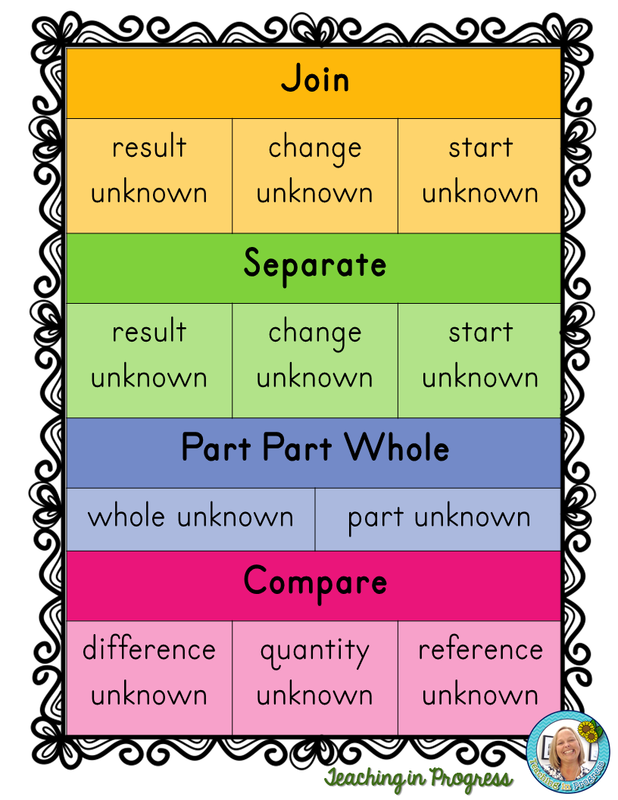 Whole Unknown 2 + 3= __ Joe had 2 green pencils and 3 yellow pencils. How many pencils did Joe have altogether? Part Unknown 2 + __= 5 or 5 - 2 = __ Joe had 5 pencils. Two are green and the rest are yellow. How many yellow pencils does Joe have? Compare problems also look at relationships between quantities. But here we are not looking at a set and its subsets, but the relationship between two distinct sets. Joe had 5 pencils. Meg had 3 pencils. How many more pencils did Joe have than Meg? Joe had 3 pencils. Meg had 2 more pencils than Joe. How many pencils did Meg have? Joe had 5 pencils. He had 3 more than Meg. How many pencils did Meg have? Each type of problem requires a different level of thinking and problem solving. If you do daily word problem practice and would like to ensure that you cover all problems types, or if you haven't incorporated a word problem of the day and would like to start, grab this freebie! It contains a copy of the problem type poster and some word problems with work mats to get you started!